Rage against hilly friction: GT Avalanche bike review. GT is a company that is well known in the world of cycling, for the tremendous amount of really solid bikes they put out over the years. The Avalanche is one of these that is available for a really affordable price and will rise to the top of your list in terms of good bikes. We looked at the GT Avalanche and thought to ourselves that it looked pretty high-end. When we saw the price tag, we were in shock. It isn’t the lightest bike in the world, that’s for sure, but it is definitely a great one on the trains. It has a shortened head tube, a low rise set of handlebars and an overall ride that can be classified as being aggressive. The fork at the front is a nice Suntour XCM that has 100mm of travel, which makes it a great choice for those entry level to mid level trails we all love on a casual weekend. The design of the frame was also pretty unique, with a triple triangle design that gave it a lot more stability and durability. The cost of this was that the bottom bracket of the Avalanche was a little lower than you would expect it to be, which led to a little bit of worry on the harsher trails. 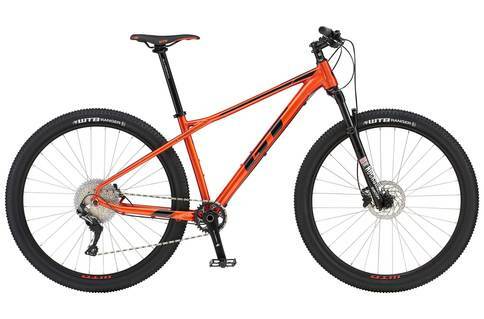 This is a bike that will serve you well in any situation, and is meant for those of you who want a reliable performer that isn’t over the top in terms of price. Overall, the GT Avalanche was definitely a very enlightening experience. We loved how it handled so much that we wanted to give it a full rating, but it did have areas that it could see improvement in. We can’t wait to see how these are implemented in the future!